A stricken climber left to die on Everest was saved by an American guide and a sherpa who found her by accident as they returned from the summit. The dramatic rescue of the Nepalese woman has reopened a passionate debate about mountaineering ethics, a year after the controversial death on the mountain of the British climber David Sharp. The woman, identified only as Usha, was found on Monday morning suffering from severe altitude sickness about 550 metres beneath the 8,848m (29,028ft) summit. She was at a similar altitude to the cave where Sharp died on May 15, 2006, after an estimated 40 climbers passed him by, most of them without making any attempt to save him. His death sparked an international controversy, with some arguing that a rescue would have cost more lives. Others, including Sir Edmund Hillary, condemned the cynicism of commercial mountaineers. Usha, like Sharp, was apparently on the sort of barebones expedition that charges clients typically as little as £4,500 and provides them with only basic equipment. Also like Sharp, she was too weak to move when she was found by David Hahn, a veteran American guide, and his sherpa, Phinjo Dorje, on their way down from the summit. Mr Hahn and Phinjo Dorje decided to risk their own lives by taking her with them, even though she was only semiconscious and suffering from severe cerebral oedema, or water on the brain. "I was very concerned because her oxygen had run out. She was virtually unresponsive, and in a precarious spot on the mountain, on a steep snowy slope," Mr Hahn told The Times via satellite phone from Base Camp. It was a huge risk given the harsh conditions in the "death zone", above 8,000 metres, where there is so little oxygen that people need all their strength to keep themselves alive, let alone someone else. After giving Usha a steroid injection to ease her altitude sickness, they pushed and dragged her down the treacherous south side of the summit for four hours until they reached Camp IV, at 7,920 metres. They were met there by members of a team of British doctors from the Caudwell Xtreme Everest expedition and others from Mr. Hahn's International Mountain Guides group [including guides Casey Grom and Mike Haugen]. "The doctors were a huge help in stabilising her," Mr Hahn said. Realising that they would have to take Usha to Camp III, at 7,300 metres, where the rest of the British team was waiting, Mr Hahn and his four colleagues wrapped her in a sleeping bag and strapped her to a sled. 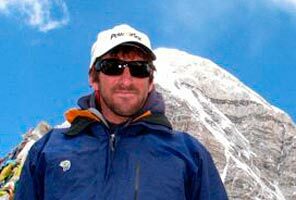 Accompanied by André Vercueil, one of the British team, they spent nine hours dragging and lowering her by ropes across the Lhotse Face and through the rocky Yellow Band. At one point on the face they watched in horror as another woman climber fell 1,000 metres to her death. 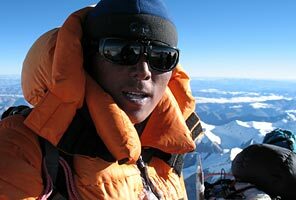 They did not reach Camp III until about 9pm, long after nightfall  and 12 hours after they had first found Usha. "I was pretty exhausted, because I'd put my oxygen on the patient during the rescue," said Mr Hahn, who has climbed to the peak of Everest nine times. "To tell you the truth, I didn't think she'd survive." Mr Hahn and his team continued down to Camp II on Monday and were at Base Camp yesterday, recovering from their exertions. Usha was also brought to Base Camp yesterday, where doctors are still treating her for altitude sickness. She was not capable of speaking on the telephone. Mr Hahn, who helped to rescue two climbers on Everest in 2001 (read the story of that rescue,) said that he had never considered leaving Usha behind and believed that most experienced climbers would have done the same as him. But the rescue has refuelled the debate about whether climbers have a responsibility to try to rescue those in trouble. Terence "Banjo" Bannon, a veteran Irish climber, wrote in an open letter last week: "I have been climbing for 25 years, and I've seen people risking their lives to save others. Those who say there was nothing they could do are lying."